The concept to integrate Marlene's interests and contributions was to pay reverence to the process of extracting information from the brain using multielectrode recording. 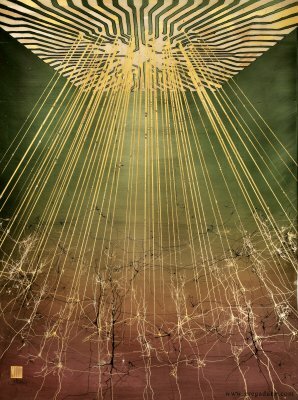 The piece depicts a 64 unit multielectrode recording device penetrating into the layers of cerebral cortex and recording from cells in roughly layers III/IV. The spikes are seen traveling upwards through the electrodes and into the chip above where the electrical potential changes are moving through the traces on the chip. As further homage to Marlene's work, the piece is split into two vertical halves. The idea is that the left side of cortex is attending to a stimulus whereas the right side is not. As a consequence to the attention being paid, there is higher fidelity in how independently the neurons are firing on the left side. This is represented by the neurons being finished in more varied karats of gold, as well as the spikes moving up the electrodes being independent from one another. In contrast, on the right side, the nonattending cortex is firing more closely as a unit (with some noise interspersed) as can be seen in spikes traveling up adjacent electrodes with greater time correlation than on the left. I wanted to make a statement with this piece by contrasting the messy and convoluted lines of the brain with the absolutely regimented and precise lines of its digitization to call attention to the brain's chaos and order. The electrodes coming down is almost meant as a sort of reference to an alien abduction, the strangeness that brain's behavior results in its own investigation. It is paying reverence to the brain's lofty attempts to understand itself through neuroscientific study, elevating human consciousness.